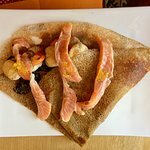 This creperie is fantastic. 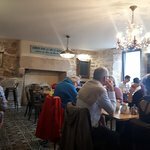 The restaurant setting is great in central Audierne with some tables with views of the beautiful harbour. The service was slick even during a busy lunch setting, with the staff welcoming and friendly. 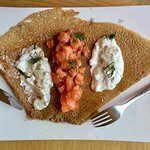 The crepes were excellent, and I'd particularly recommend the saint Jaques a la bretonne which was so good I had it on two separate visits. Local cider made a perfect accompaniment. My children both loved the sweet crepes. The value for money was also good. I'd highly recommend a visit! 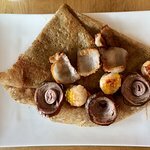 The best crepes I've ever had! The restaurant was busy, being late July, but the service was excellent, living up to the standard of the food. The location is geat too, facing the water. Might well be going back! We stumbled upon this crêperie at later than normal lunch time. The young woman who took care of us was very attentive. My husband and I shared a large salad and one very tasty jambon-fromage galette since we were going to have an early dinner. Their ice cream dessert was scrumptious! While this was not one of the best meals I've ever eaten, it certainly hit the spot! Lovely meal in a relatively new place in Audierne. Booked for 7pm, it was packed by 8pm, and that on a Saturday late in September. All French people too, which tells you something. Galettes are light and delicious and the fillings are plentiful. Good view over the harbour and nice decor. Hope the waitress lady managed to cope with the influx of diners! 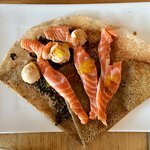 Been to Creperie Ty Clech? Share your experiences!